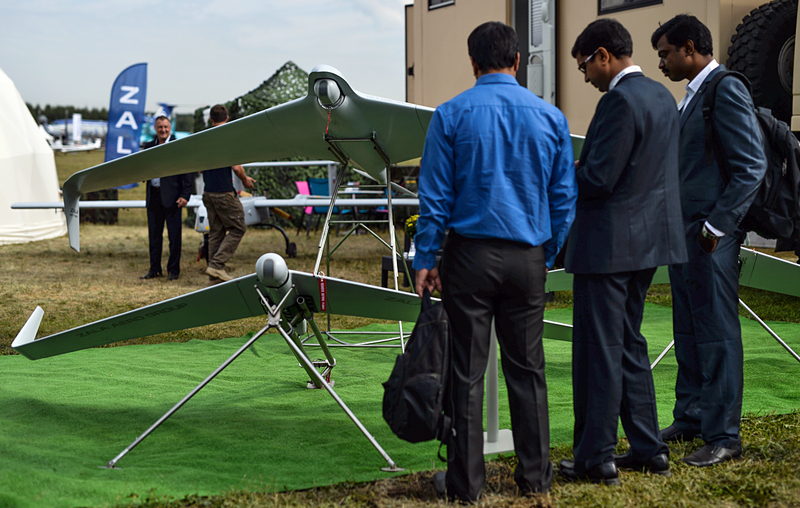 Visitors look at the Zala 421-16E5 UAV, presented by Zala Aero Group, part of the Kalashnikov corporation, at the MAKS-2015 air show in Zhukovsky in the Moscow Region. The Kalashnikov Concern claims this ship will be able to detect a target with the help of a swarm of drones, and then destroy it. The Kalashnikov Concern has proposed the idea of building an unmanned catamaran robot, capable of carrying several tactical unmanned aerial vehicles (UAVs), either aircraft or quadrocopters, to the Ministry of Defence. The new ship, several dozen metres long and with a displacement of several hundred tons, would be developed as part of the integrated target programme “Creating Promising Military Robotics by 2025”, approved by the Russian Defence Ministry. The fully autonomous system – the Triton, a concept proposed by the ZALA AeroGroup, a subsidiary of Kalashnikov, will be able to conduct air, surface and underwater reconnaissance, and destroy targets using remotely controlled weapon stations, equipped with a 7.62-mm PKT machine gun. The vessel will be equipped with two 200-HP marine diesel engines, and will have a range of 750 nautical miles (a little more than one thousand kilometres). The UAVs will add another thirty kilometres to this range. “We are actively developing our knowledge in the field of unmanned vehicles,” Alexey Krivoruchko, General Director of the Kalashnikov Concern, told Izvestia. “Our goal is to integrate them into a system, parts of which can interact with each other. This idea of ​​a system of unmanned ships on which unmanned aircraft are based, will enable us to patrol the coastline, and participate in search and rescue operations, in a fully autonomous mode. The final dimensions of the Triton are not yet known, but since it will be equipped with two diesel engines, it is assumed that this robot will be a long catamaran several dozen metres long. On board this “unmanned aircraft carrier” will be an impressive arsenal of television, radar and sonar equipment used to detect an enemy. This system will be able to not only independently keep track of the surface, air and underwater conditions in the patrol area, but also to direct frogmen, helicopters and boats of the Coast Guard against the enemy. UAVs, such as the flying wing ZALA 421-08M and the quadrocopter UAV ZALA 421-21, belonging to the tactical reconnaissance class, will be stationed on board. These can be launched “by hand” and can transmit a picture of what is happening behind a nearby hill, grove or ravine to the control centre. Crucially, because of their small size, these scouts remain virtually undetectable to the enemy, and can carry out secret radar or video reconnaissance. Vadim Kozyulin, Professor of the Academy of Military Sciences, said the development of air combat robots remains one step ahead of marine robot construction. He said these ships would be used in “packs” of 10-15 ships, to find and destroy enemy submarines. The price of one unmanned vessel will be approximately $20 million, which is much lower than the cost of a modern ship with similar features.